The A14 over the River Ouse. A leading business organisation says celebrations are on ice despite the go ahead for a £1.5 billion upgrade of the A14. The chilled reception for the long-awaited decision on the A14 comes from leaders of the Cambridgeshire Chambers of Commerce. The group says it will wait for construction work to actually start before uncorking the champagne. 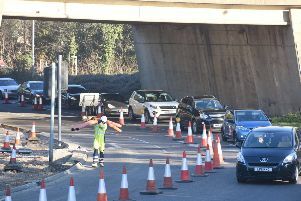 The chambers’ chief executive John Bridge said: “We are delighted that the Department for Transport has at last understood the real necessity for improvements to this economically vital route, and has given the go ahead for its upgrade. “We will however keep our celebrations on ice until the work actually starts. “This announcement has been long-awaited but it’s merely another step in a very long process and the proof of the pudding will come when everything is in place for its implementation. Secretary of State for Transport Patrick McLoughlin has approved the long awaited works, which will see extra capacity added to the A14 between Cambridge and Huntingdon. It is hoped construction work will start later this year. Chris Taylor, director for complex infrastructure at Highways England, leading the A14 Cambridge to Huntingdon improvement scheme, said: “This is great news for everyone who uses the A14 through Cambridgeshire, from local residents and businesses to national and international haulage companies. The new bypass and widened A14 will open to traffic in 2020.